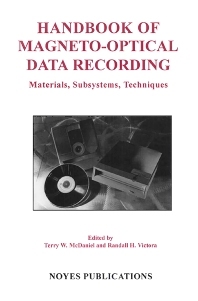 This handbook brings together in a single volume expert contributions on the many aspects of MO data recording, including the materials in use, techniques for achieving recording function, and storage device subsystems. As a multiple author treatment, it brings perspective from many viewpoints and institutions. The insights delivered should be valuable to a wide audience from students to practitioners in all areas of information storage. Practitioners and students in all areas of information storage. "This Handbook is highly recommended for anyone with at least an active interest in the field ..." - RIC News.